But horses and tool tips will help. Mount & Blade 2: Bannerlord's latest blog update tackles the important matter of party and army speed. You never really know if you're the type of person who gets excited reading about the speed of an unladen donkey or a band of knights until it happens to you. Don't look at me that way. It's interesting stuff! 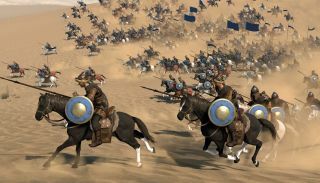 Like its predecessor, Bannerlord features a system that calculates the speed you can travel across the map based on several factors, but Taleworlds has introduced a bunch of new wrinkles while also adding something Mount & Blade was never great at: clarity. "The game, after all, can bring your party to a crawl but it should at least have the decency to explain to you why everyone and their cow can move faster than you on the map," reads the blog post. "Our previous titles were a bit lacking in the transparency department since they didn’t share much beyond the end result." You'll be able to check on your speed by just looking at the info bar, and for a more detailed description, you can hover over it and see exactly what's having an effect on your party's pace. If you're just watching the world pass you by, you can check the tooltip and see exactly how it's been calculated, giving you a better idea of what you'll need to do to get to your destination faster. Generally, you'll want horses. Even if your army is full of infantry, you can still bring along spare horses for them to ride, giving them a boost. They've not spent their life in the saddle, however, so they will still be slower than proper cavalry. Larger armies are also slower, which means you can outrun bigger armies that would wipe you out in a fight. Cargo will weigh you down, too, but only if it goes over your carrying limit. Increasing carrying capacity with more soldiers and animals will help. Solutions can create other problems, though. Since larger armies are slower, adding more soldiers and horses to allow you to carry more could still have a negative effect on your speed. Animals also have a herd effect—when there are a lot of them, they'll be more difficult to herd, slowing your army's progress. All the fanciful wish fulfilment stuff—winning tourneys, getting a castle, winning epic battles—will be wonderful, probably, but I'm really here for the logistics. Sweet, sweet logistics. Still no release date, I'm afraid. I've got it in our fantasy draft, however, so it had better be this year.